Homes in the Columbus, Ohio market are moving faster than ever. The area has seen an upward trend in the market, with homes flying off the market in the blink of an eye. In fact, things are going so well that there aren’t enough homes available to meet the demand! So what changed and what does this mean for you? Keep reading to find out. Local realtors point to the makeup of recent buyers when trying to identify why the housing market has taken off in recent months. They have noted that more families are looking for areas with houses where they can stay for longer periods of time and have access to jobs and good school districts. In March 2016, 2,362 homes were sold in the Columbus area. This is up 6 percent from the previous year. Meanwhile, the housing inventory has fallen 21 percent from the previous year. That’s actually been a big concern for many who want to get into a house as it means selection is slim and competition more intense. Nationwide Mutual Insurance Company recently conducted an analysis of 400 metropolitan areas. 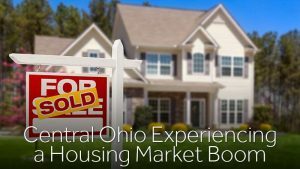 They ranked the Central Ohio housing market as one of the top 10 healthiest areas in the United States. They looked at appreciation rates, employment changes, demographics and mortgage markets to forecast future expectations. This snapshot allows the analysts to predict potential downturns in the housing market before they develop. The company also identified 10 areas that are most likely to experience sustainable expansion in the near future. This list included Columbus, as well as two other Ohio cities — Cleveland and Dayton. Are you jumping in on the housing boom? Perhaps you’re looking to put your home on the market or are just moving to the area. Either way, make sure a call to Zippy Shell is on your list. We take the hassle out of every move. Zippy Shell offers storage solutions so you can store unneeded items while showing your home or waiting to move into your new home. We also provide portable moving solutions that allow you to pack at your convenience and ensure all your belongings arrive at your new home without a worry. We’ll simply deliver a mobile storage container to your home, and when you’re finished packing it up, we’ll pick it up and deliver it to your new place. It really is that easy. One of the top reasons to partner with Zippy Shell for your next move is that we make it convenient AND affordable. Our services cost between 15 and 20 percent less than what other storage and moving companies will charge you. We even offer special discounts for military members and college students! When you’re ready to start your move, we’ll be here for you. Give us a call today to get a free quote!